Grove City, OH went above and beyond to help a neighbor in need. It is acts like this that make us a FAVORITE among our neighbors. Pat on the Back for this NEIGHBORLY act of kindness! I stopped in your Grove City, Ohio location this morning to pick up some things I had coupons for. As I was pulling into a parking spot, I ran over a cover for a sewer clean out and it came out of the ground and a screw punctured my front tire. It went flat almost immediately, I went inside and was given the information on who to contact about getting it taken care of. The man working there was very helpful and considerate of my plight. I was not in a great mood and he offered to help me change the tire. I know he didn’t have to do this, but he did it anyway. I just wanted you to know about him and I hope you appreciate him as much as I do right now. Thank you for having such great employees, it is definitely refreshing in this day and time. 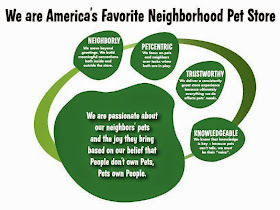 Great example of going above an beyond to be America's Favorite Neighborhood Pet Store. Thanks!